Ever since the latest CHA the stamping bulletin boards and blogs have been buzzing about a new machine called the Stampmaker so of course I was excited to be given a chance to try it out for myself! What is it? : The Teresa Collins Stampmaker by Photocentric is a personal stamp making machine, yes you read that correctly you can now make your very own clear polymer stamps at home! How cool is that? It comes with exclusive designs by Teresa Collins or you can design your own images or use copyright free images to make your stamps. The kit comes with the machine and UV light bulbs, two 8 1/2″ x 11″ sheets to print your own designs, five medium stamp packs ( 4″ x 2 3/8″), five small stamp packs (1 3/4″ x 2 1/8″) two stencil and two embossing packs (4 x 2 3/8″), magnetic clamp, a brush, adhesive for your stamps, an acrylic bock with handle, printed and CD instructions. How does it work? : First you need to choose your artwork, you can use the negative designs that come with the kit but I chose to make my own by using copyright free images I found on line. A wonderful source for these is Dover Publications. I picked my images and used my own picture editing software (I have Windows Microsoft Picture It!) or you could use the software that comes in the kit on the CD. Your image needs to be black and white and you need to reverse it, in other words you want the negative of your image. Your image needs to be as black as possible for good results and also to have a nice black border around the edges helps too. Then you print your images on the special paper provided in the kit and cut them out. Lay one stamp pack into the magnetic clamp, lay your artwork face down, turn on the machine, place the clamp into the machine for three minutes then remove. Cut the edges off the pack and wearing gloves use soapy water and the provided brush to clean the stamp (don’t scrub too hard). Place the clean image into the provided tray with water and put back into the machine for two more minutes to harden it then remove and trim around your stamp, dry it, add some adhesive ( I found the provided adhesive a bit too sticky and used my own repositionable adhesive) and that’s it, you’re done! My results: I decided to try a variety of styles, sizes and images to see what would work best. I discovered it’s important to have a wide black border around your images as suggested , it makes it easier to trim and get good edges on your final stamp. And images with thick or solid lines gave me the best results, a couple of smaller images I tried with very thin lines did not work. (A side note: I’ve since learned I did not follow directions and should have put the stamps with thin delicate lines into the machine face down for 3 seconds before following the regular steps). I also tried a photograph that had shades of black, white and gray and that did not work either, your images must be very clearly black and white. I’ve been told that using the editing software that comes with the machine , instead of my own software,will give you good results with photos, I’ll have to try that next time. So it’s important to follow the suggested guidelines for choosing and printing your images, they really will help you get the best end results. Also handle your negatives with care as they can get scratched. The only real problem I had was with air bubbles in the final stamp, two of the ten stamps I made had an air bubble which left a “dent” in the stamp so I didn’t get a complete image when I stamped it. I pressed the clamp down tightly to flatten out the pack but maybe I needed to press harder? Other wise I found it actually pretty quick and easy to make my stamps, the steps are easy to follow and the machine is easy to use. Note though you will need your own timer as they recommend not to use the timer on the machine. And the stamps I made that had thick clear lines came out really nicely. I used Close to My Heart inks to stamp my images because it’s formulated to work with clear stamps and I always get good results with it. Also it’s important to note they recommend you not use solvents inks (like Staz-On) on your stamps made with the Stampmaker. 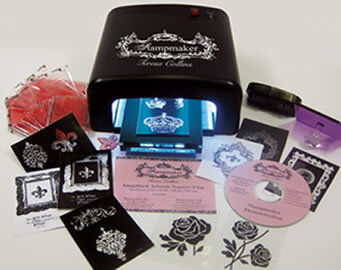 The kit also comes with embossing and stencil packs to make your your stencils for painting or embossing plates to use with die cutting machines like the Cuttlebug. I made a few projects with my new stamps, here’s an example of the negative along with the finished stamp, a cute little girl with a book. 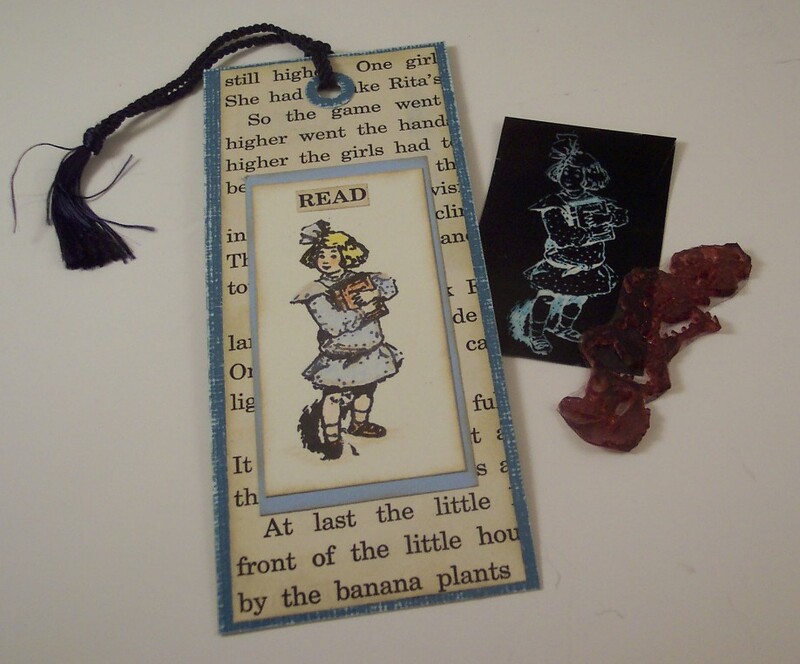 And here’s what I made with it, a sweet book mark. Check back the first of next week for some more projects I made with my new stamps and for a chance to win your very own Stampmaker! Can you make sentiment stamps? Without a black line around them? Yes, you can make sentiment stamps with it, no need to flip the text as you’ll lay the negative face down, but still make it a negative (reverse black and white) image. I would just go crazy with that machine. I love the clear stamps better than any stamp I have used. So you can make stamps that no one else has or maybe never have. What about old black and white photos? Does it work on them?Thank you for this give away. Yes, you can make stamps with photos, I didn’t have luck with mine but I found out I needed to use the software that came in the kit instead of my own editing software to get good results with a photo. I’m anxious to try it again. Angela, I’m not sure what you mean by over process? Were they too hard or something? For sentiments if the lines of the text are thin you might want to flash the back side of the pack for 3 seconds first, it’s supposed to help with delicate lines. That was one problems I had because I didn’t flash them. I’m no expert though, so you might want to ask the people over at Photocentric, they are super nice! I love this, it would be so much better to make a stamp all your own.